This week I was in Williamsport, PA, for a Curbside chat conversation. Wow, do I have the greatest job in the world. Here I am in this group of very interesting, engaging people sharing information that is going to really help them transform their community. And they are completely into it, working harder than I am to make it work. This is my third trip to Pennsylvania in the past 18 months and I’m finding myself feeling very connected to the place. Not only do I consistently like the people I’ve met there but the cities are generally full of great potential; lots of great buildings and interesting historical landmarks within neighborhoods with solid, traditional structure. Many thanks to the amazing team at the Larson Design Group for making the Williamsport event happen. I can’t wait to come back. I’ve been on television a few times – not my best communication channel – but this one from South Bend turned out okay. The first step for communities planning their future is to have a rational discussion about growth, the men said. Those that plan successfully will learn from their mistakes and make land-use decisions for a strong financial foundation, they said. It’s not all about density, Marohn said. I’ve received a lot of positive feedback from this interview I did with Break Through Radio. The reporter was really quite nice and interested in the topic (so appreciated) and it was a fun interview. She also got what I was talking about, which makes me a little nervous since I have a vow to never use the “sustainable” word. With 36 US cities bankrupt, local governments are desperate to get out of debt. But at what cost? "The problem is that we are stuck in the current development paradigm which prioritizes the illusion of quick revenue over sustainable infrastructure," Marohn says. While a city may incur sizable tax revenue from developing a strip mall or large building complex, the effects of maintaining everything from sidewalks to roads to support those projects in the future adds up. Recent estimates calculate the annual cost of road preservation and major road repairs needed in the US to be an astounding $43 billion dollars. I also discovered this week that a college course on transportation planning at UC San Diego is using a piece from our blog written by Nate Hood as part of their course material (The Politics of Dumb Infrastructure). I have it on good authority that for the price of a plane ticket and a Big Mac, pretty much any university located in a mild climate can get Nate and his pink shorts to show up for a guest lecture. Hurry and book now before his popularity makes him unaffordable (something I perceive will happen soon). My favorite new blog is Another Place for Me. This woman, Gracen Johnson, is very good – incredibly engaging – and I really hope she keeps at it. Thanks for the link. It is always wonderful to stumble across such a talent. 8 Reasons You Might Like a Small Town from Gracen Johnson on Vimeo. A while back I started using the term STROAD to denote a street/road hybrid and have been really amazed at how it has caught on. This week it showed up in the Winnipeg Free Press in an exceptionally good article explaining the concept in local terms. I’ll give you one quote, but you really should read the entire thing. A busy urban street is inevitably contested space between its different users. Some motor vehicles need to temporarily stand or park, while some need to move. Some cyclists are adept and quick; others meander with nothing but time on their hands. On the sidewalk, there are pedestrians who want to stand or sit around and those who have places to go. The greatness of a busy urban street comes in no small part from allowing for this kind of organized chaos. Congratulations to our friend Kaid Benfield for releasing his latest book, People Habitat: 25 ways to think about greener, healthier cities. I’ll need to see if we can get Kaid for a podcast since we’ve been on an author tour lately with Steve Mouzon last week and Leigh Gallagher this week. Steve and I actually talk about Kaid – you’ll have to listen. 4) The way to avoid (3) is to design by committee and then to ignore feedback, because anyway (1). 1. Making tax dollars stretch is especially difficult in cities like Des Moines, Clark said, which is older and largely built-out. The growth in tax base no longer keeps pace with the rising cost of providing basic services, covering employee health care and pension costs, and keeping roads, sewer systems and municipal facilities in good working order. 2. Des Moines has cut $28 million out of its annual operating budget over the past five years and eliminated more than 300 full-time jobs since 2000. 3. The city is considering hiring a fundraising professional for three years to oversee all of Des Moines’ fundraising efforts, solicit donations, obtain grants and find opportunities to sell naming rights and sponsorships. I tell you what, Des Moines…..you give our Executive Director Jim Kumon a call. For less than the cost (in dollars, not dignity) of what searching for a professional panderer will be, we’ll come down there for a Curbside Chat and show you all the high return investments sitting there in plain sight. Speaking of dollars, dignity and high return investments, congratulations to the city of Memphis for their recognition by the U.S. Chamber of Commerce as having “innovative” leadership. They are turning dimes into dollars in Memphis and improving people’s lives in the process. What an exciting place. I had a fascinating lunch with an economic in Washington D.C. yesterday. He agreed that we are trying to re-inflate the housing bubble, not merely slow the rate at which it collapses, and it reinforces the sinking feeling I have that we’ve bought ourselves some very expensive time, but will not be able to put off the inevitable. Here’s some on that from ZeroHedge. In Minnesota we have laws that require local governments to sign off on highway improvements that change alignments or build new facilities within the city limits. This often leads to Mn/DOT bribing communities with aesthetic improvements so they can keep their (completely theoretical) design speeds where they want them (a bad trade for everyone). Apparently they have no such laws in neighboring Wisconsin where state DOT officials appear poised to ram an improvement down the city of Milwaukee’s throat based on – you guessed it – their long term projections. Traffic projections are nothing more than institutionalized incompetence. In its plan to improve the I-94 east-west corridor, the state Department of Transportation has eliminated the least expensive and least intrusive options — choices favored by Milwaukee — that would keep the freeway at three lanes in each direction. Instead, the state is proposing to expand and relocate parts of the 2.85-mile stretch of highway between 25th and 70th streets. The proposal would displace some Milwaukee businesses and, in some residents' eyes, possibly ruin a beautiful neighborhood by sending a 40-foot-high, double-decked highway system into its midst. "We're looking 25 to 30 years ahead, a generational view from the time it's built," DOT spokesman Michael Pyritz said in defending the freeway expansion. "We have to build it for today and into the future, and meet expectations as much as possible." Even more insane is a state as broke as Illinois – a state that makes California look downright financially responsible – insisting on building a new 47 mile highway over the objections of Chicago regional transportation authorities. We can laugh at the rosy estimate that shows a 40-year timeframe for the project to break even (did I mention this state pays a large percentage of their bills in IOU’s?) but this is one of those vaunted public/private partnerships (you know, where the public takes the risk and the private sector has the reward). Note that 40 years ago was the year I was born. That year gas prices "spiked" to 43 cents per gallon, the Vietnam war was ended and the entertainment rage was a game you played on the television called Pong. If anyone tells you they have a project that will pay off in 40 years, you laugh in their face. A joint project of the Illinois and Indiana departments of transportation, the Illiana is envisioned as a 47-mile east-west toll road, connecting I-55 in southern Will County to I-65 in southern Lake County, Ind. It would be a built-in partnership with a private developer. Saying it needs to protect those private negotiations, IDOT has provided only sketchy financial numbers to support its claim that the Illiana would pay for itself by 2053. The CMAP staff has its doubts. Under its rosiest scenario — healthy toll revenues, low-interest rates and on-target construction and maintenance costs — the staff estimates taxpayers would have to subsidize the Illiana to the tune of $440 million over 35 years. Its pessimistic estimate is $1.1 billion. As Orlov and I learned in the USSR, you collapse with the infrastructure you have. Since consumers are having more trouble now getting to the stores, the stores are physically moving back to the consumers. Here we have stores proliferating that can be patronized and staffed by people without dedicated autos who instead walk or bike. I was a little worried that this was someone out STROADing, but it was apparently just a drunk college student. As Nassim Taleb has said, debt fragilizes the system. You can’t really blow up unless you have debt. Here’s one small Iowa city that is learning that the hard way. The City Council of Coralville has piled up about $280 million in debt in recent years, the highest debt per capita for a city in Iowa. The $14,511 burden for each of its 19,219 residents is seven times higher than Des Moines or Iowa City. It’s enough to pay for 38 Iowa Hawkeyes football season tickets or three semesters of tuition at the University of Iowa. And for those of you that write me convinced that we should trust the federal government to handle all this, well….it is good to have a healthy fear of large bureaucracies, where small, human errors can be magnified many times over. Sleep peacefully, my friends. The incident happened when two Mark 39 hydrogen bombs were accidentally dropped over Goldsboro, North Carolina, after a B-52 bomber broke up in midair. There has been persistent speculation about how serious the incident was and the U.S. government has repeatedly denied its nuclear arsenal put Americans' lives at risk through safety flaws, the newspaper said. But the newly published document said one of the two bombs behaved exactly in the manner of a nuclear weapon in wartime, with its parachute opening and its trigger mechanisms engaged. Only one low-voltage switch prevented a cataclysm. Fallout could have spread over Washington, Baltimore, Philadelphia and even New York City, the paper said, threatening the lives of millions of people. In the document, Parker Jones, a senior engineer in the Sandia National Laboratories responsible for the mechanical safety of nuclear weapons, concluded that "one simple, dynamo-technology, low-voltage switch stood between the United States and a major catastrophe." And on a happier note, it is nice to see that our auto culture is capable of producing people who find a way to share happiness. Smile everyone, and enjoy your weekend. See you back here Monday for the release of our big Neighborhoods First report. Can’t wait. Welcome to all of you who are discovering Strong Towns this fall. In addition to the blog, podcast and TV channel here, join us on the Strong Towns Network for some additional discussion on this post and more. 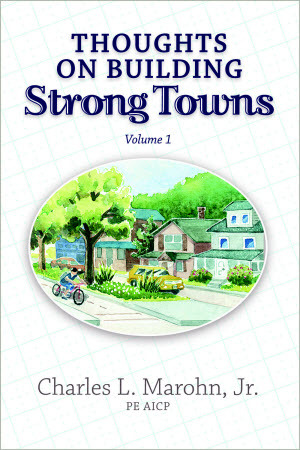 And if you'd like more of my work, check out my book, Thoughts on Building Strong Towns (Volume 1). It is a primer on the Strong Towns movement and an essential read for those wanting to get up to speed quickly.